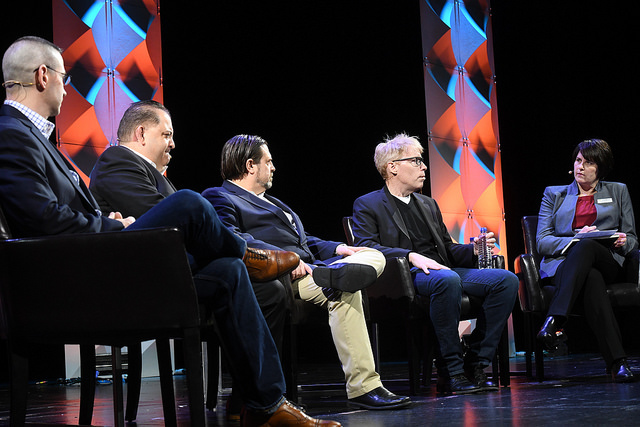 As our Enterprise Summit panelists shared at EC18, the world we live in today leaves little room for anything but the cloud. During the Enterprise Summit at last month's Enterprise Connect 2018, conversation among our four IT executive panelists centered on cloud communications of various sorts. That's not necessarily surprising, given the transformative power of cloud. As you plan for or dive deeper into your own cloud-based approaches to communications and collaboration, perhaps you can find some wisdom in the insights shared by these thought leaders: John Herbert, EVP & CIO, 21st Century Fox; Ron Sattan, VP & CIO Americas, Mott MacDonald; Michael Sherwood, director of technology and innovation, city of Las Vegas; Jason Kasch, CIO, Structural Group. No question, cloud communications has taken on strategic importance within each of these organizations. As Herbert said, "There is no world in which we could actually do what we're doing or about to do without cloud being core to our strategy." Herbert is speaking about the world of content creation and distribution in which 21st Century Fox operates as a global media company. The company has tens of millions of film and TV assets, which it distributes in 90 countries, in more than 60 languages. Quite simply, legacy architecture doesn't scale for digitization of this scope, he said. Among the cloud collaboration services 21st Century Fox relies on are Slack for team collaboration and Zoom for video conferencing -- not only among its 25,000 employees but with external partners, too, Herbert said. Bringing everybody onto the same cloud platform was a "pivoting point," he added, because it enabled a consistent experience for all. Mott MacDonald, a global engineering firm, sees the value of cloud for scale, as well, Sattan said. That was a key factor in the company's decision a few years ago to align itself with Microsoft and its Office 365 platform. Particular to the communications piece, he added, the company is about halfway through the migration from a premises-based Skype for Business platform to Skype for Business Online for its 16,000 employees. As Mott MacDonald has transitioned to a cloud-delivered software-as-a-service model for its business and communications applications, it's also done away with its enterprise WAN, Sattan noted. That's not without its challenges, he admitted, but said the company believes the Internet itself is all you should need when using cloud services. "When you go all in, go all in," he added. If eliminating legacy infrastructure doesn't seem reasonable for your organization, you'll want to take heed of some advice from Structural Group's Kasch, who has been using cloud voice services from UCaaS pure-play RingCentral for about six years (even before it migrated business applications like CRM off premises) at this 3,500-strong global engineering services company. Pay attention to your circuits, uptime, and bandwidth, and "don't underestimate the strain on the infrastructure that going all-in on cloud produces," he said. While cloud may tax your infrastructure, it should open the opportunity to free up IT and business resources for more productive work, panelists said. Sherwood, with the City of Las Vegas, put it this way: "Really, if we're not number one, number two, or number three, we try to avoid those lines of business... and I don't think anybody in the audience, or even myself, would say you've heard of Las Vegas as being the best cloud provider or the best service provider." While Las Vegas isn't as advanced in its cloud migration as other organizations represented on the panel, it is incorporating cloud-based communications and collaboration capabilities via Cisco Spark into its smart city initiative, Sherwood noted. The city may only have 3,500 employees, but the 20,000 sensors it's installed around the city are becoming communications devices, he said. If a sensor detects a problem, for example, it'll open a Spark channel and send snapshots from its camera that allow stakeholders to see what might be happening on the street or in a park, he described. "We're not just using [Spark] for human collaboration but machine-to-machine collaboration, so the operator or handler can actually see what's happening and make decisions ... and they can pull in the teams they need in real time," Sherwood said. Like Sherwood, Kasch likes to avoid getting his IT team involved on projects better serviced by cloud providers. "If you're in the world of cloud today ... you really should be thinking, 'Can I buy it?' 'Can I buy it and tie it together with these microservices-type capabilities?' And, as a last resort, 'Can I build it for my organization?'" And at Structural Group, that last resort build decision is really just an interim. With that "very first line of code that goes down, I start looking for another company that I can buy that service from," he added. "I treat what we've written as a proof of concept that we go to market with, and I start asking my partners to 'deliver this tool to me, deliver this tool to me, deliver this tool to me' and we'll turn it over" – and that's certainly not something you'd have heard uttered in a legacy environment.